WHY THE GIANT PUPPETS RIVER JOURNEY SECRECY? 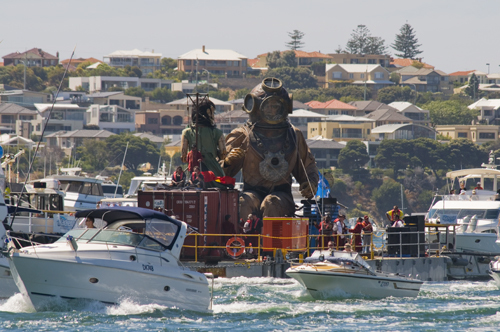 Bugger me; there WERE supersized puppets on the Swan River near Fremantle late on Sunday. In the end it was almost impossible to hide the monstrous marionettes as they weaved their way on a barge down the waterway to the port city. Yet, for some inexplicable reason the crew at the Perth International Arts Festival last Thursday didn’t want to tell WAtoday.com.au the wee giant – The Little Girl – and The Diver would make their farewell trip via Fremantle. Even after we spied a newspaper ad confirming the puppets would be at the East Street Jetty around 5pm, PIAF still denied it. But why? Why would PIAF try to pull the wool over the eyes of potential marionette moochers, when thousands lined the riverbanks on Sunday afternoon to get a glimpse of the puppets from French company Royale de Luxe. And dozens of people took to Facebook to post pictures of the puppets heading to the port city. If I was managing public relations for an arts organisation, I would’ve thought this level of exposure was gold. Maybe the good folk at PIAF thought portsiders would pinch the puppets, given their local footy team the Dockers lack a decent tall? Or was PIAF worried if portsiders knew the puppets were heading their way, they wouldn’t make the rare trip across Fremantle Bridge to see them? 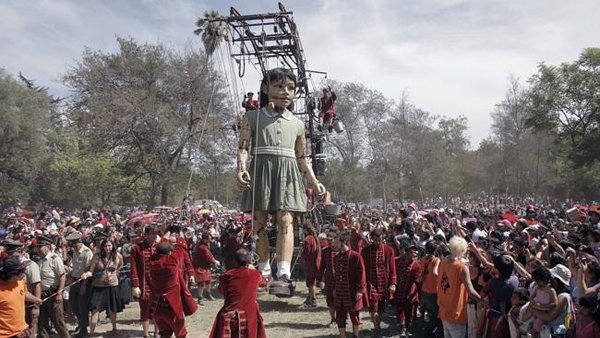 According to Main Roads, The Giants had more than 1.4 million visits over the three days they sauntered through the streets of Perth. Kudos to PIAF for recognising the event would resonate with Perth audiences but they missed a trick by not letting us know the puppets would be barging their way to Fremantle. It was strange indeed as this Freo’s View blog was the first to publish this after hearing it late on Wednesday afternoon on the ABC Radio Drive program with John McGlue. I received an email from Brendan Foster of WAToday, who had read my blog post, to ask if my story was correct because PIAF had denied it was happening. I got calls from the City of Fremantle if I could delete the blog post because PIAF was worried about getting a large crowd at the jetty and they had not allowed for that with security. I also received emails and comments on Facebook telling me I had spread untrue rumours, but I hadn’t! Luckily people believed my blog post and the WAToday story and came to the Swan river and the Freo East Street jetty, where the barge with the larger than life marionettes arrived at 2.45 pm. FREO’S VIEW had over 2,700 hits on Sunday! 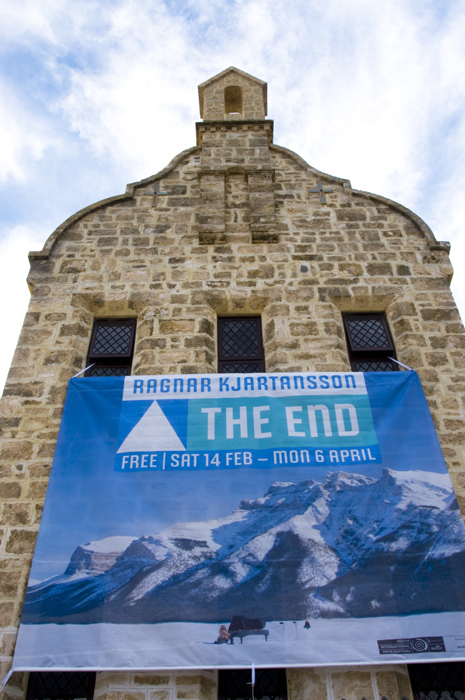 There is a very interesting musical art exhibition by Ragnar Kjartannson at the Fremantle Arts Centre that is well worth seeing. It is probably not for impatient or cynical people as it is slow, a bit irreverent, surreal and quirky. The show is part of the Perth International Arts Festival and another part of the show is shown at the John Curtin Art Gallery at Curtin University. The big gallery shows large screens with the massive snowy landscape of the Rocky Mountains and people playing instruments in different locations. But they are playing together and it is a fascinating experience. Another gallery shows a video of three young women singing on a round bed. They are like Sirens or Mermaids. The wide angle camera just drives around them as they perform, also showing the interior of the Carnegy Museum of Pittsburg. Very intriguing! And for me it was meditation time at the third gallery where a large screen shows a split image. My first impressions was that it was a mirror image until I realised they are two different videos of a location under a bridge. It is very very slow, and hence relaxing and one could sit in that dark gallery for hours. This is a very different show and for an acquired taste only, but I highly recommend it! I had numerous requests to post the photos of the Fremantle farewell of the PIAF Giant Puppets as a slideshow so here they are. The Giant Puppets are on their way back to France after an amazing success at the Perth International Arts Festival-PIAF that attracted hundreds of thousands of people and challenged the public transport in Perth. Today thousands came to the Swan River foreshore to say goodbye to the huge marionettes. The sound of didgeridoos announced the progress of the barge along the river. The Girl and the Diver were also accompanied by a large flotilla of boats to the East Street jetty in Fremantle, where the puppets were put on the back of trucks to be driven to the port. GIANTS PUPPETS COMING TO FREMANTLE! In a great coup for our city the GIANT PUPPETS are coming to Fremantle on Sunday! They are coming for the Perth International Arts Festival-PIAF but in a change of plans are now boarding a barge at 11 am in Perth and will arrive at the East Street Jetty at 5 pm. I have not heard if the 6-metre-high Girl and the 11-metre-high Sea Diver will be leaving the barge but it will be a great spectacle anyway to see them on the Swan river. The puppets are the brainchild of the French group Royale de Luxe and have pulled massive crowds where ever they perform. STOP PRESS!!!! It appears that somebody jumped the gun and informed ABC Radio yesterday about the river trip of the giant puppets, but it is in fact not part of the performance and appears to be based on the fact that the puppets will depart from Fremantle Port. I took my information and details from the ABC Drive program with John McGlue so not sure who at PIAF got the idea of making it public. THERE WILL BE NO PUBLIC EVENT AT THE EAST STREET JETTY IN FREMANTLE! !